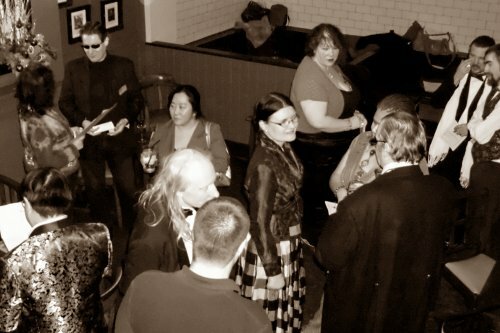 We provide a timetable with all our games, covering the murder mystery party in detail. The timetable typically includes the briefing, key events (such as when clues are released), the point at which characters can die (for those games that involve fighting), and the end of the game. We estimate that our games take about 2.5 to 3 hours to play through. However, these times are approximate – some groups will be faster and some will take longer. The main variables on the length of game are player experience and size of group. In general we’ve found that a larger group takes longer to play one of our murder mysteries than a smaller group. (Even the same game takes longer with more players.) The main reason for this is that is simply takes longer to find those you need to talk to in a larger group – and you may be drawn in into other people’s stories. As for experience, less experienced players tend to take longer to work out what they need to be doing. An experienced player can read our character sheets and quickly work out what they need to do first. It takes an inexperienced player a bit longer to figure that out, and so the game will take a little bit slower. So given those variables, when do you draw the murder mystery to a close? What the player has brought – their personality and how they are feeling. The character they have been given – whether it “works” for them. The chemistry between them and the other players. So this variation means that some people will “finish” their game sooner than others. So when do you end the game? My preference when I’m playing is that I would rather run out of time (and not quite finish everything I need to do) than have too much time (and be waiting for the game to finish). As a host, this therefore means that once all the other timed events have passed and we’re in the last segment, then I am monitoring the game. It’s hard to explain exactly what I’m looking for, but I am monitoring the overall energy in the room. I’ve found that as a game progresses towards its climax, some players become less involved because they have achieved all their goals (or some of them have become unachievable). And as more players become less involved, the energy drops – and that’s the time I draw the game to a close. Sometimes I’ll see players who appear to have stopped playing the game. If that happens, I usually check with them to see if they have actually stopped, or whether they are just taking a break for a couple of minutes before resuming. So of course this means that I can’t predict the exact end time of the game – it will be an approximation. So if the scheduled end time is approaching and the game still seems to be going well, then I will let it continue. Conversely, I will draw the game to a close early if things have slowed and some people have stopped playing. This entry was posted in Tips for hosts on September 15, 2014 by Steve Hatherley. Steve is one half of Freeform Games and wrote Death on the Gambia, Hollywood Lies and Halloween Lies. He has edited many, many others. He lives in Yorkshire, England with his wife and daughter. Hollywood Lies – actual play! Mo on 3 tips for a successful Christmas murder mystery party! Rosie Beckett on 3 tips for a successful Christmas murder mystery party!